Ruby is a clone of Sapphire. The prime difference between a Red Sapphire and a Ruby is the shape of crystals from which they were cut. Both are Corundum, or Aluminum oxide and in both the colourant is Chromium. The hardness, cleavage optical properties are basically the same. The only obvious difference between the two crystals is the fact that a Ruby crystal is shorter, thicker and terminates in a flat surface and Sapphire crystals terminate in a taller point. Since Ruby grows shorter and thicker, it is harder to get a really big properly cut, Ruby. Many older, larger Rubies are cut far too shallow to have any life in them. The colour is great but the have no sparkle. The other significant difference is that Ruby fluoresces a strong red and Sapphire glows in almost every other colour. Very helpful for us, almost irrelevant for you. Transparent “pigeon’s blood red” Ruby, the premier quality, is a rare gem indeed. It was/is found in Burma, now Myanmar, but now all of the old mines are almost completely worked out. A very few fine stones are found each year, but many more are brought in from the surrounding areas to be “found” just as a new foreign buyer arrives. Material from Vietnam, Sri Lanka, and Thailand are all very nice but only one in a thousand pieces comes close to perfection. But perhaps “perfection” is not what you really like regardless of the cost. Many of our clients today find the old standard colour too dark and ominous. They prefer the lighter, brighter stones, still a good solid red, but more lively in appearance. We have, in stock, many colours, sizes and shapes from little tiny one pointers, up to three caraters. Ruby, Sapphire and Diamond are the “big three” in the gem trade. They have long dominated the upper price ranges for all types of jewellery because of their rarity, hardness and the ability to maintain their sheer beauty over long periods of time. We have had Rubies in for a new setting that could be reliably dated from the late 1700’s and it was as good looking as the day it was cut. But you must remember that the ladies who wore it were “Ladies” with servants, maids, cook staff, and gardeners. That ring led a life of luxury. 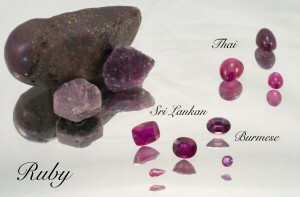 Ruby, like Sapphire, can also appear with an asterism, or star. When needles of Rutile engage with a Ruby while it is still in formation, they can array themselves in an 120 degree separation. When they do, these fine needle are what gives a ruby a “star”. The lesser qualities are opaque but the finest gems are so translucent that they approach transparency. The tops of these stones are always cut in domes or “en cabachon” to allow the star to play over the whole surface. The bottoms of the poorer qualities are usually lumpy, unfinished domes. On the finer stones, many bottoms are as good as the top if they are polished fully. And if the stone is thick enough, it can then be sliced down the middle for a matching set of earrings. Either that or the bottom can be faceted and the life of the stone jumps a magnitude. These “bufftop” stones are very rare and quote amazing to look at. We regularly have a wide selection of Rubies, at various sizes, shapes and price points in stock and available for your viewing pleasure. This makes it easy for the lucky person born in July to view a good selection from which to choose their birthstone jewellery.